Naheed Kurban Nenshi (born February 2, 1972) is a Canadian politician who is the 36th and current mayor of Calgary, Alberta. He was elected in the 2010 municipal election, becoming the first Muslim mayor of a major North American city. He was re-elected in 2013 with 74% of the votes. Nenshi was born in Toronto, Ontario, and raised in Calgary. His parents, Noorjah and Kurban, were South-Asian-origin immigrants to Canada from Tanzania, and he has a sister. Nenshi donated 10% of his 2012 salary, amounting to CAD$20,000 to a Calgary charity in response to a 6% pay raise approved for city councillors. Nenshi was ranked second most important person in Canada next to Prime Minister Stephen Harper by Maclean's magazine 50 top Canadians list for 2013. He was educated at the  Nenshi was a constant debate opponent of Toronto Sun journalist Ezra Levant, and they continue this relationship as Levant is a recurring critic of Nenshi's policies. In 2002, Nenshi wrote about how cities can retain young professionals and utilize resources as area effectively in a publication entitled "Building up. Making Canada's cities engines of growth and magnets of development" In 2006, Nenshi was the chief author for 'ImagineCalgary's 100 year plan'. He has co-founded two citizens' groups aimed at improving Calgary's civic government. In 2009, Nenshi was invited to become a founding member of Civic Camp, an active citizenship forum that encourages and enables Calgarians to actively engage and collaborate ideas in civic affairs. He co-founded city hall watch dog group 'Better Calgary Campaign'. He was an instructor in non-profit management in the Bissett School of Business at Mount Royal University and wrote a regular municipal affairs column for the Calgary Herald. Nenshi first ventured into politics in 2004, running unsuccessfully for a seat on Calgary's city council. His 2010 campaign for mayor was dubbed the "Purple Revolution" was uniquely a viral campaign which relied heavily on using social media sites such as Facebook and Twitter to promote his platform and hyper-engage voters. The "Purple Revolution" was so chosen according to Nenshi I.T. campaign specialist Richard Einarson, was for a broad appeal across the socio-economic spectrum of liberal red and conservative blue voters. Beside viral campaigning, the volunteer body of 'Team Nenshi' were given a great degree of autonomy to exercise creative talent. The team promoted the cause through creative Guerrilla Marketing tactics such as 'Operation Purple Dawn'. Nenshi's supporters converged on the city in a mass rally on the evening before election day. They advertised Nenshi by posting signs and writing platform slogans with chalk graffiti on pavement of high traffic locations. Supporters offered their homes as venues for coffee parties where Nenshi spoke to the gathered about his platform. The coffee parties offered a friendly atmosphere for friends to discuss the volatile nature of sensitive political issues without risking their relationships. Approximately 40 parties were held during the campaign. A late September poll showed that his campaign was generating interest as he sat third with eight per cent support, although well behind the leaders, alderman Ric McIver (42%) and local media personality Barb Higgins (28%). His growing popularity led to greater scrutiny of his views, including a public dispute with Calgary Police Service chief Rick Hanson over the cost of policing the city. Days before the election, a Calgary Herald poll showed that Nenshi's grassroots campaign continued to gain momentum as he had 30 per cent support among decided voters, placing him in a statistical tie with McIver and Higgins. He polled the strongest amongst younger voters, believed to be the result of his social media campaign. Nenshi's surge in popularity carried through to the election, when he earned 40 per cent of the vote, finishing nearly 28,000 votes ahead of second-placed McIver. Being a Shia Ismaili, Nenshi became the first Muslim to become mayor of a major Canadian city. His win was viewed as a breakthrough for the use of social media as an election tool, and when considered with his faith and background, made international headlines. His election is seen as major signal of the shift in Albertan politics and the demographic of Calgary. He engaged voters with a mutual two-way dialogue as "politics in full sentences." According to Nenshi's chief of staff, Chima Nkendirim, Nenshi's headquarters was vandalized on September 11, 2010, the anniversary of the World Trade Center bombings and Eid al-Fitr the end of Ramadan. Nenshi also received racist emails. Nenshi however believed the vandalism to be an isolated non-racially motivated act. During this fundraising Gala, Nenshi issued a challenge to his opponents to confront him directly and not to engage him in a proxy campaign of lobbying as he warns his supporters that his opponents will likely engage in. In September 2013 when Nenshi's campaign began in earnest, he revealed the donors of his campaign before the election and urged his opponents to do likewise. Nenshi promised to instigate changes to improve transparency of City Hall's municipal affairs as one of his 2010 campaign statements. According to the documents Nenshi's 1631 supporters derive from a wide range of core supporters. Among Nenshi's larger contributors were contractors from the housing construction industry. According to Nenshi indicating that not all among the trade were antagonistic to Nenshi's anti-urban sprawl policies enacted early in his term. For his campaign platform Nenshi proposed to abolish the $4,800 granted to home builders, aiming to save the city $33 million per annum. According to Nenshi, the subsidy over a decade contributed to the municipal debt of $1.5 billion. Nenshi wants the free market factors to take hold of the housing market and developers to contribute to funding infrastructure to far reaching suburbs by paying levies. The Manning Centre for Building Democracy supports the motion for the principle of capitalist free market values. The group however believes developers should pay slightly increased taxes as long as inner city communities equally also contribute their share of growth costs. In October 2013, Nenshi and Counselors Andre Chabot and Gian-Carlo Carra proposed to realize a 2008 plan by then-Mayor Dave Bronconnier to redevelop the International Avenue (17th Ave SE) as a vital transportation hub. Since inception the plan in 2010 the project has been delayed due to costs. The plan incorporates a C-train line and rapid bus lanes, proposed in Calgary Transit's 'Route Ahead' plan. As well the revitalization incorporates urban renewal projects like renovated apartments and business buildings. Carra studied the circumstances for Forest Lawn's urban decay and planned the neighborhood's restoration as his master thesis. Carra explains that the neighborhood has not been adequately integrated since the neighborhood was incorporated into Calgary since 1961. In 2013, Nenshi supported the proposed Keystone XL pipeline network. He explained that opposition and protests were foolish as the pipe network could mitigate environmental damage caused from the transport of oil. In 2014, Nenshi refused to present musician Neil Young with a white hat. Nenshi stated that he didn't normally present honours to entertainers. Young was performing his 'Honour the Treaties' benefit tour to raise legal funds on behalf of the Athabasca Chipewyan First Nation. The ACFN is appealing government approval to expand fracking on their territory. In 2014 Nenshi delivered a speech to the Calgary Economic Development which held a series of lectures about diversity. Nenshi explained that there was a lack of ethnic and gender diversity among senior city staff. Nenshi stated that although the city had an excellent record hiring minorities and women they may experience a ceiling to promotions and advancement. Nenshi's policies of exercising greater city control over urban grown to manage urban sprawl is one of Nenshi's key campaign promises. It is definitive key pillar issue of Nenshi's political philosophy. As expected Nenshi's council has regularly collided with key associations of Calgary's housing industry. Frictions between the Nenshi council and key housing industry associations are an ongoing, overlapping, and escalating affair. Grievances continuously surfaced during the 2013 election, for example the 'Cal Wenzel video', rumour-mongering about a pro-development slated council, and upcoming Wenzel slander lawsuit of 2014. Early in 2013, Nenshi's council suspended relations with the Calgary branch of the Canadian Home Builders' Association. The CHBA as a result was banned briefly from attending planning sessions. This action was conducted after, the Calgary branch president Charron Ungar commented that the city was enacting a policy of "suburban freeze".Ungar commented upon a city plan which scheduled two suburb developments within 10 years. Nenshi declared that the CHBA and the Urban Development Institute (UDI) were representing the housing industry poorly after a controversial article was published by the UDI. The article suggested that diverse demographic elements within a community might necessarily find suburban living comfortable. Nenshi suspended relations with the UDI soon after the article was published. Nenshi also felt that it was more expedient for the city to deal directly with the construction industry. In 2013, a video was leaked of Cal Wenzel the CEO and founder of Shane Homes speaking to panel of Calgarian home builders about a plan to influence the decisions of the city council after the upcoming elections. In the video Wenzel spoke of plans to raise $1.1 million to enlist the support of Preston Manning's conservative foundation the Manning Centre for Building Democracy. According to the speech, former Mayor Dave Bronconnier counselled Wenzel on how to control council motions with eight votes. “So for whatever and however, we have to ensure that we end up with the eight votes.” Wenzel proposed as a solution to circumvent direct confrontation with Nenshi's popularity. Wenzel named councillors the industry could rely on to support motions in favor of the lobby and he supported with donations. Nenshi has ordered a probe into what he described as distasteful and shadowy possible violations of electoral laws. In the wake of the release of this video, and violations of campaign fund limits set at $5,000, the Manning Centre has come under scrutiny. In late 2013, Wenzel filed a $6 million slander lawsuit against Nenshi after he stated that Nenshi did not apologize after sufficient time given. Wenzel stated that his reputation was tarnished and he was vilified as a subject of political opportunism during Nenshi and his allied counselor's platform campaigning. Wenzel stated that his comments in the video were taken out of context and manipulated by Nenshi to promote an agenda. Wenzel also complained of Nenshi tentatively comparing him to 'Godfather', as a reference to the titular character of Mario Puzo's novel and screenplay The Godfather. Nenshi in an interview with David Gary, host of CBC Radio's Calgary Eyeopener',' described the meeting as scene from the film The Godfather. When asked to clarify if called Wenzel the 'Godfather', Nenshi ambiguously responded 'maybe'. Preston Manning, founder of the Manning Centre for Building Democracy, responded in an interview with CBC News about the foundation being referred to in the Cal Wenzel lobbist video. He stated that Calgarians don't want lobby slates of any position in municipal politics. That voters wanted independent candidates who will represent them. Manning explained that the purpose of the 'municipal government program' is to train fiscal conservative candidates for the election, but to respect the democratic process and not to interfere with city politics. Manning stated that he didn't believe in intimidation. Manning also states that the foundation is also to function as a research think tank that conducts research in social issues. However according to a paper entitled "Managing the Cost of Growth" published by the Manning Centre in October 2013 the report's recommendations coincided with Nenshi's campaign policy to abolish the subsidy to home building companies As long as inner city communities are likewise subjected to contributing to growth costs. The study also advocated increased taxes for newer outlying communities that need specialized utilities such as water and roads. Throughout his term Nenshi has met extensively with Chief Roy Whitney leader of neighbouring Tsuu T'ina Nation, and former Chief Sandford Big Plume to discuss matters of mutual assistance with growth. In 2011, the Nenshi and Big Plume has negotiated tentative agreements to ensure the security of greater access safety services such as emergency medical services, police, and fire. The city agreed to provide utilities such as water to support the expansion of the Grey Eagle Casino to possibly serve as water works extension throughout the Tsuu T'ina community in the future. The press has made many comparisons dubbed as 'Nenshi vs Ford' comparing the Mayors Naheed Nenshi of Calgary and Rob Ford of Toronto, because of the similarities of both mayors being first term and the uncanny similar circumstantial challenges Toronto and Calgary faced. The most recent comparison being a flood during the summer of 2013. Nenshi became the first Calgarian mayor to marshal the Calgary Pride parade. Ford declined to marshal the Toronto Pride Parade citing that visiting his family cottage was an unbreakable tradition. They compare the stellar rise of Nenshi to the controversies surrounding Ford. Although the comparisons are allegorical examples of the differences of the administration, there was an actual 'Nenshi vs Ford' challenge issued by Nenshi. Nenshi challenged Ford to a friendly bet during the 2012 Grey Cup where the Calgary Stampeders played the Toronto Argonauts. In 2012 Ford challenged Nenshi among other mayors to a fitness weight loss challenge. The goals of urban revitalization are realized through projects such as 'Supporting Partnership for Urban Reinvestment' (SPUR) initiative. Nenshi's council debuted SPUR's pilot project as the restoration of the Kingsland neighborhood. The city solicited feedback from the community and will expect to budget $230,000. However, the project was delayed until August by the floods of 2013. The Nenshi administration completed capital public works projects approved by his predecessor Dave Bronconnier, including the westerly extension of the C-Train line, Peace Bridge, and the construction of a traffic tunnel to the Calgary International Airport commenced. Nenshi's council voted to discontinue fluoridating Calgary's water supply. As part of his campaign, Nenshi advocates to legalize "secondary housing" as a solution to housing shortage. The proposed bylaw is intended to safety-standardize the estimated 10,000–40,000 secondary suites. As one of the last decisions of Nenshi's term in 2013, the city motioned to waive the $4,485 application fee for secondary suites. However, the decision will have to be enacted during the next government to enact. In 2013 the city approved a project to convert a block of derelict heritage buildings adjacent to the Central United Church into a first-of-its-kind robotic carpark. The facility will accommodate 338 cars and incorporate the renovated buildings, which the managing firm agrees to restore. Nenshi states this will improve the aesthetics of the eyesore skid-row like buildings. The project is self-funding as Calgary firm 'Heritage Property Corporation', will attempt to raise the $40 million through private investment. Nenshi ordered an investigation to find cost-effective solutions for a sanitary capacity issues affecting residents of northwest Calgary. If the $50 million expansion of the at-capacity Bowness sanitary line is not implemented, development in new and established communities in the quadrant may be delayed until 2017. The sanitary line also provides the town of Cochrane contributing to the strain. Nenshi shared many Calgarians' distaste of the free-standing public art project entitled the "Travelling Light" completed in 2013. He described the work as "awful and not the best use of tax dollars". The sculpture was sited along Airport Trail and drivers could not appreciate the "Big O" according to Nenshi. Travelling Light is described as a balanced 17-metre circle ring topped with balanced street lights. As the motif of Travelling Light is to represent transportation. Travelling Light cost Calgary $471,000 and was paid through a grant from the Public Art Program which reserves 1% of annual budget for public art projects. The sculpture was chosen during Bronconnier's term by a panel of 5 Calgarians out of a pool of 55 submissions. Travelling Light's submission was German, although three submissions were from Calgarians. Mounting international, domestic, and celebrity criticism of Alberta's underdeveloped Green technology infrastructure prompted former Premier Ed Stelmach's government to commit $4 billion to a province-wide green capital projects plan in 2009. In 2009 former Calgary Mayor Dave Bronconnier and Pembina Institute were awarded the 'Reaching Out to Global Energy Award' at theUN Climate Change Summit for the technical and engineering collaboration with Calgary's 'Greening the Grid' program. The 'Greening the Grid' program's objectives are to empower city facilities by renewable sources by 2012. Calgary Transit's C-trains' electrical needs were partially provided by wind power in 2001, by 2009 the inception year of 'Greening the Grid', the C-train were fully empowered by 'Ride the Wind' a program launched by Enmax and wind power engineers 'Vision Quest Windlectric. committed $250 million on the 'Greening the grid' program. In 2013, Sun Media journalist Ezra Levant said the city of Calgary contracted $340,000 to Pembina which he accused of being an anti-oil lobby group with insufficient scientific credentials. Sun Media journalist Renato Gandia mentioned the Pembina Institute's contracts in an article with the headline "Mayor Naheed Nenshi says work done by left-leaning Pembina Institute think tank was not political in nature". Nenshi said it would be reasonable to hire the "best guy" regardless of personal political values. Nenshi ordered a corruption graft probe into the finances of city-owned utility company  Holden resigned in 2011 after CBC News revealed a business trip to Monaco in 2008. Holden was a guest of German software company SAP and conducted business and watched the Monaco Grand Prix. Holden violated Enmax ethics policy to discuss with the company incidents of gifts over $100. Holden earned the 5th place distinction of Forbes top 10 CEO screw ups for 2010. By the terms of contract Holden was granted a significant severance pay of $4.6 million. Prior to the 2010 election, mayoral candidates McIver and Nenshi debated the justification for extravagant privileges of senior Enmax staff in their debates. Candidate Nenshi warned that Enmax was a city-run company and funds were taxpayers'. McIver described Enmax as a 'Air of Entitlement.' In 2011, in the wake of Holden's resignation, Nenshi's council and Enmax's board implemented reforms such as decreasing the salaries of senior staff, and a higher meritorious standard for bonuses. Enmax hired new management and a new CEO Gianna Manes, who is experienced in mass project completion such as the Shepard Energy Centre which Holden advocated for. In 2011, Nenshi performed the ground breaking ceremony for Enmax's Shepard Energy Centre, a natural gas power plant capable of generating 800MW, more than half the electrical needs of Calgary. The facility is scheduled to come on line in 2015. The facility is described as Calgary's biggest project and will cost $1.3 billion. Nenshi's council approved of the project which was planned during Bronconnier's term. The Shepard Energy Centre is connected to the Albertan power grid. Nenshi's council granted $5.5 million to build the 200-seat "Decidedly Jazz Danceworks Dance Centre" in the Belt Line neighbourhood. The new facility will address the expansion requirements of the Decidedly Jazz dance academy. The council decided that the facility would address the need to provide a permanent venue for the distinguished academy that served Calgary for many years. According to Nenshi, the facility will also help to fill the need in Calgary for more performing arts venues. Nenshi also hopes that this development would help stimulate development in the Beltline. The city constructed its first of many bicycle lanes in the downtown core. By 2020, it is estimated that the city will have 30 km of cycle lanes. In 2014, a plan will be submitted to begin to extend the network and enact a bylaw. In late 2013, the city has entered into speculative agreement with the Tsuu T'ina to resume negotiating the extension of Stoney Trail through a portion of Tsuu T'ina land for a ring road. The band members will vote in a referendum in October to decide on the issue. The city was in negotiations for over 50 years, with the last proposal in 2009 being rejected. Nenshi described the proposal as 'win-win-win', however, should the band decide to ratify the agreement, construction won't commence for two years. On October 24, 2013 Tsuu T'ina tribe members voted in a referendum to permit the construction of the ring road on their territory. In exchange for 450 hectares of land, the nation will be compensated with 2,150 hectares of Crown land to expand their territories. The nation will also receive $340 million. Calgary Transit presented Nenshi's administration with the 'RouteAhead' plan for review. The plan calls for $13 billion to be invested over 30 years to expand and upgrade Calgary Transit's capabilities, for which funding is still pending. To address the problem of congestion of rush hour ridership, the city is upgrading busy C-train platforms to accommodate four-car trains. The city council has approved $200 million for the acquisition of 60 new four-car trains to replace obsolete U2 units which have served Calgary Transit since 1981. It is expected that the increased frequency of the trains will relieve crowded and full trains. After Canadian Pacific Railway (CP) cancelled an environmental study of the expansion of Alyth train yard, the city approved to continue funding the study environmental impact the yard causes the residents of adjacent Inglewood and Ramsay neighborhoods. 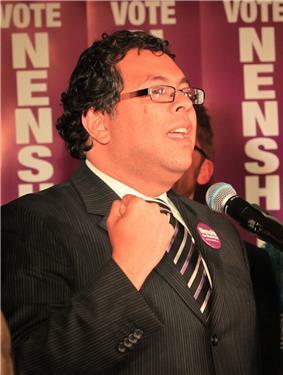 Nenshi attacked Canadian Pacific over the reassignment of the company's night crew. The company decided to close the 'Locomotive Reliability Centre' of the Alyth train yard. As the Canadian Transportation Agency ordered it to relocate 400m away, as residents complained of the noise. Nenshi rebuked CP over the collapse of the 101-year-old Bonnybrook Bridge. The bridge was weakened by the 2013 Alberta floods, as its structural supports were washed away by surging flood waters. He blamed a massive layoff prior to the accident for lax inspection standards and called for cities to have greater management of CP affairs within their cities. Nenshi and CP agreed to improve communication in the future and improve relationships after several cars transporting petroleum derailed in late September 2013. The Nenshi administration initiated many programs to improve civic administration and clarify transparency of city political affairs, organized around themes such as "transforming government" and "cutting red tape". These initiatives are intended to improve the business and quality of life for Calgarians. The Cutting red tape initiative was estimated to have saved Calgarians 33,000 in hours and $1.12 million in productivity. Nenshi sought the advice of Calgarians for further feedback and ideas of how to make city services easier to access in 2012 for its 3rd phase of cutting red tape. The term "alderman" was changed to the gender-neutral "councillor". In 2011, Nenshi was advised by civil advocacy group Civic Camp to challenge the citizens of Calgary with an initiative to personally take responsibility and encourage their neighbours do three things to improve their community for '3 Things for Calgary Program'. In 2013, Nenshi implemented the 'Enough for All' program to half the demographic of 50,000 Calgarians living in poverty by 2023. The plan doesn't call for more spending, but to uncover and administer effective solutions to connect disadvantaged Calgarians with resources and the community. Nenshi made implementing this solution as one of his campaign promises. The town of Airdrie passed an anti-bullying bylaw that was advocated by Airdrie teen Mackenzie Murphy in 2013 after she survived a suicide attempt in December 2012. She was persecuted for two years by online bullying and at school as her classmates suggested that she should kill herself. Airdrie Mayor Peter Brown who was sympathetic to her distress tasked his council to investigate the legal precedence to enact the bylaws. She hopes to meet Nenshi to advocate for similar laws in Calgary and spread public awareness of bullying. Nenshi and Premier Redford expressed interest in her activism. Nenshi Chief of staff Chima Nkemdirim, suggests that Nenshi is open to dialog should she decide to take the initiative by scheduling an appointment. In 2013, the city council enacted a bylaw banning smoking in playgrounds and other places where family and children play. The length of council terms was extended three years to four years. Continuing on a downward trend of violent crimes since 1991, Calgary together with Canada's crime rate has dropped. As of 2013 the national crime rate has dropped below levels since 1971. It is unknown what has caused the decline in violent crimes, however StatsCan analyst Mary Allen correlates that communities with higher standards of socio-economic conditions tend to have low crime rates. Many other urban areas have experienced similar decreases in crime rates, and recent studies suggest this may primarily be due to decreased environmental levels of lead. Calgary has experienced significant percentage drops since 2011, such as a 23% drop in robberies. In 2012 Calgary's Crime Severity Index of 60.5 is below national rating of 75. In 2013, community service groups and the Calgary Police Service banded together to form the Safe Communities Opportunity and Resource Centre (SCORCe) as a cooperative effort to improve effective services for vulnerable Calgarians. Nenshi opened the center in a ceremony. In September 2013, the city extended the contract of Police Chief Rick Hanson until 2017. Nenshi credits his leadership as a factor for Calgary's low crime fortunes. The city created the Community Investment Fund to grant $252 million between 2012 and 2016 to renovate and construct new Calgarian public recreation and community facilities such as libraries. The fund provide funding for community groups to renovate their facilities that provide services to Calgarians. The fund is composed from major sources such as annual rebate of $42 million from the Alberta government, $4 million from GST refund, and $150 million from a fund created by urban developers for community growth. The fund was a response to address the need for access for recreational services, especially sports and physical facilities for children. Such as ice rinks and swimming pools. The fund also addresses the need for renovations for many aging facilities providing essential services for Calgarians. The city will construct four new facilities providing access for 84,000 Calgarians. Nenshi approved a pilot project in 2011 for mobile food van servers. The project debuted during the first "YYC Taste the Trucks" an annual festival in 2011. After a two year pilot trial, the city council approved a process draft a bylaw to permit the food truck industry permanently in late 2013. The Calgary Economic Development (CED) organized a trade mission for Nenshi to showcase Calgary to meet with Chinese business and government officials to forge and reassert ties between China and Calgary. Through the CED, Nenshi launched a campaign entitled 'Be Part of the Energy' aimed to promote tourism and encourage businesses and professionals to settle in the city. Address the problem of inaccessibility of housing for families and attain success with the Plan to End Homelessness which began before his term. The city operates non-tax non-profit corporation, 'Attainable Homes' which partners up businesses to help provide for impoverished Calgarian families. However the corporation was not initially Nenshi's initiative as it was founded in 2009. Mass building projects were completed and initiated during his term. As Calgary grew into a metropolis with challenging needs the city experienced typical increased incremental costs of living such as rises in property taxes. Taxes began to rise before Nenshi's government as both the provincial and city governments have increased taxes since 2007 for several years and Mayor Dave Bronconnier commissioned civic work projects, as Ctrain extension. Tax rates increased on average 5-10%/year for city taxes and 3-8%/year for provincial taxes. The increase in taxes was a source of frustration for many Calgarians over the years, especially rising 30% during Nenshi's three year term. Nenshi has encountered frustrations as his council finds it difficult to budget yearly with unsecured sources of provincial and federal funding. Nenshi with other Canadian mayors rebuked the Federal government for lack of capital funding for necessary projects such as transportation infrastructure projects such as public transit and improved highways as they have in the United States. The lack of fiscal clarification from the federal and provincial government has economically damaged the city causing debt and raised erratic municipal taxes as the city struggles to secure funding for projects to maintain the city. Dave Bronconnier faced similar challenges as Nenshi managing a growing city. Nenshi is tasked with completion of Bronconnier's necessary projects such as extension of the C-train. However, Nenshi together with Stephen Mandel attempted to negotiate with Premier Alison Redford to enact a charter to replace the decades old ambiguous Municipal Act, to better define the roles of provincial and municipal governments. As the uncertain nature of non-municipal funding is unpredictable. Redford was forced to resort to Austerity measures such as educational cutbacks early in her term. Her government is experiencing a 5 year deficit, and will go into debt as it continues infrastructural spending. Nenshi stated that taxes remained the lowest in Canada when compared to other major Canadian municipalities. For the 2014 budget the city voted to return the initial $52 million provincial tax refund as debated early in 2012. The refunded tax gap afforded the city to reduce an initial planned 6% increase in residential property tax to a 5% increase. The city implemented a 10-year plan to merge the business tax together with the non-residential property tax. Until then Calgary was one of last cities to have a stand-alone business tax. It is estimated that taxes will decrease 65% for Calgarian business over the decade and save the city $1.3 million in operational overhead. Towards the end of first Nenshi's term, the Manning Centre published a study entitled "Growing the Democratic Toolbox: city council vote tracking" by: Jeromy Anton Farkas. The research measured the performance of 2010 city council on: the economic stances of councilors (taxpayer friendly scale), frequency of open meetings, and attendance of council meetings. According to the study these topics were of importance to Calgarians. Contrary to Nenshi's critics, who were frustrated with tax increases and capital spending and had nicked named Nenshi as 'Spendshi'. Farkas gauged Nenshi to be a moderate spender. Nenshi scored 50.7% and was ranked 5th/14 counselors on the 'Taxpayer Friendly Scale'.Nenshi's score was based on how many times he voted against motions of capital spending with a sample of 73 motions pertaining to city finance. The city council asked Calgarians for their opinion of how to invest a $52 million surplus from an over collection of property taxes. A debate was held on May 2013 and offered five options: return the money to Calgarians as a rebate, invest in revitalizing older neighborhoods, improve Calgary Transit, reduction in taxes for businesses, and reducing the city's debt. A live debate inspired by the reality show "Dragon's Den" was held at the Devonian Gardens. In the wake of the devastating flood of 2013, the city council voted to implement Nenshi's proposal to use the surplus towards flood relief. However, the Canadian Taxpayer Federation warns that motion could become a permanent tax grab. That the money was intended to be returned to citizens. During deliberations of the 2014 budget majority of the councilors voted in favor of returning the 2013 provincial $52 million tax refund. The council has allocated the future $52 million per year tax refunds for the next decade towards transit options such as an express bus route entitled the 'Green Line'. The 'Green Line' is optioned for upgrading to a C-train line at a later date. The rebate will amount to $100 returned to each Calgarian household. Nenshi's council have voted to halt council salary raises, and limit salaries of non-unionized city staff to 1.8% raises for 2014. According to councilors Shane Keating and Diane Colley-Urquhart economic factors decided the austerity measures. City unionizes however remains skeptical as Calgary city council have employed such austerity measures in the past prior to renegotiating term contracts and awarding themselves with opulent raise increases. As an avid reader, Nenshi hosted a series of videos on his YouTube account entitled 'Nenshi Reads'. He read children's stories on special occasions such as reading 'Pete the Cat: I love my white shoes'. By:Eric Litwin for the 2013 International Children's Day Festival. In 2011, Nenshi was grand marshal of Calgary Pride, the city's gay pride parade. He was the first mayor of Calgary to do so. In 2013 Nenshi proclaimed a day of "Trans Day of Visibility" as an awareness day for the challenges transgender and transsexual Calgarians face. Nenshi together with Albertan Premier Alison Redford who became the first Premier to Grand Marshal the parade, opened the 23rd Calgarian Pride parade. In his speech Nenshi addressed Québécois, inviting them to come to Calgary as the city didn't discriminate. He criticized Quebec's proposed 'Charter of Quebec Values' legislature as contrary to the Canadian Charter of Rights and Freedoms. Nenshi presided over the 100th anniversaries of many important city institutions and traditions, including the Calgary Public Library, Calgary Stampede, Mount Royal University, and Calgary recreation. He proclaimed March 29, 2012 a 'dress Western day' as a prelude to the 100th Calgary Stampede. The city was assisted in preparations for these celebrations with a $1.6 million grant from the federal government. Nenshi proclaimed the week of November 7–14, 2011 as 'Town Planning Week', to celebrate the 100th anniversary of Calgary Planning Commission's achievements. He presented David Watson the Chair of the Commission with a commemorative scroll honoring the names of past and present members. Nenshi donated $660 to two Toronto food banks, after the Calgary Stampeders lost the 2012 Grey Cup as per the terms of a friendly bet made with Toronto mayor Rob Ford. In 2012 the federal government designated the city for the inaugural "Cultural Capital" program. In 2013 Nenshi was invited as part of the Canadian delegation attend the World Economic Forum to share his ideas of sustainable urban growth, a rarity for a mayor. At forum Nenshi supported the controversial Keystone Pipeline by commenting that protesters were foolish and that transporting Bitumen by conventional transportation such as trains would cause more atmospheric pollution. Nenshi closed the 2013 inaugural 'Tour of Alberta' cyclist marathon with a speech thanking Calgarians who have banded together after the 2013 summer flood. Nenshi proclaimed April 5, 2013 as Siksika Nation. Nenshi along with other Canadian politicians past and present spoke at the gala reflecting on the life of Klein. Nenshi's rally to boost morale in the wake of a devastating flood that ravaged Southern Alberta in 2013 was well received by the press and Calgarians. He urged Calgarians to seek assistance for mental distress urged support for their neighbors mental and emotional well being during the disaster recovery. Calgarian approval from his supporters has made him the subject of internet memes parodying him as Supermayor as 2013 Summer blockbuster movie Superman. His name was used as a verb for a parody of the British WWII morale slogan "Keep Calm and Carry On", as 'Keep Calm and Nenshi On'. The likeness of Nenshi wearing Scuba gear, was designed by Calgarian artist 'Mandy Stobo' on T-shirts, to raise relief funds for the Red Cross. Nenshi co-launched book published by the Calgary Herald entitled The Flood of 2013: A Summer of Angry Rivers in southern Alberta, whicharchived the paper's coverage of the flood. Proceeds from the book supported The Calgary Foundation’s Flood Rebuilding Fund which helped victims most devastated. Nenshi wrote a forward describing the events. Some of his supporters urge him to rest from his nonstop organization by taking a nap as he coordinated relief efforts non-stop over a period of 43 hours. For an episode of his YouTube vlog series 'Nenshi Reads', Nenshi read to children at a fundraising launch of children's story 'The River Throws a Tantrum' by: Rona Altrows. Nenshi tasked former City transportation director Gordon Stewart with overseeing the reconstruction efforts. The flood caused an estimated $250 million in damages. Nenshi, commissioned a panel of engineering and environmental experts as well the community to recommend measures to mitigate damage from future floods. Senior city staff were compensated for overtime work directing the emergency efforts with $307,000. Nenshi believed the compensation to be unwarranted and called to change the compensation regulations for compensation in the future. In September Governor General David Johnston, presented the people of Calgary with the 'Governor General Commendation of Outstanding Service'. As the community effort Calgarians banded together for the city and surrounding region after the 2013 Alberta floods. Nenshi accepted the award on behalf of the city. In November 2013, the Government of Alberta granted the City of Calgary $250,000 to study the viability of constructing a water diversion tunnel. Nenshi suggested that the city acquire the tunnel-boring machinery. After the project the machinery could be used for future infrastructure projects the city has planned in the future. Soon after winning the 2013 mayoral elections in October, Nenshi chaperoned disabled Calgarian children to Disneyland for Air Canada's 21st annual 'Dreams take Flight' charity service. Early in November 2013, Nenshi delivered a comic 'roasting' speech to outgoing Edmontonian mayor Stephen Mandel highlighting the joys and frustrations of a colleague, mentor, and rival relationship. Nenshi made light remarks alluding to Rob Ford's narcotic addictions, their religious heritage as mayors of 'redneck' cities, and Mandel's council decision to construct massive public works projects such as the Edmonton Downtown arena. For the two weeks duration of the 2014 Winter Olympics, decided that city hall would fly the rainbow gay pride flag to protest the anti-gay stance of the Russian government. In 2014, Nenshi's council had decided on the fate of a city-owned 'Midfield Mobile Home Park'. The city decided to cease operations as of September 2017. The property's aging utilities such as obsolete water works have rendered the site un-viable as upkeep have become difficult and costly. Residents will be given $10,000 to assist with moving costs, and be given an additional $10,000 for compensation. Residents will also have access to counseling services. However some Midfield residents who have built equity with their mobile homes believe that the compensation is inadequate and worry that there may not a place to relocate to. The city decided against developing the proposed East Hills Estates, mobile home park. According to community President Rudy Prediger the secretive nature of the dealings have caused problematic worries among his neighbors. Some neighbors sold their mobile homes at a loss.Elderly Midfield residents who have deep rooted ties of affinity with the community are reluctant to move. Resident's relocation stresses are further compounded with the complications caused by low vacancy in Calgary in the wake of a devastating flood. In his defence statement, Nenshi explains reasons for comparing Wenzel's personae to fictional mobster Vito Corleone, the Godfather. Nenshi described Wenzel as being benevolent but ruthless when faced with opposition. Nenshi's defence lawyers also noted that Wenzel referred Nenshi as being 'dark sided' in a video which Wenzel addresses an audience of home builders. The City of Calgary has ongoing friction with the Calgary Street Ministries since 2005, although this relationship has existed prior to Nenshi taking office, Nenshi is accused of being an anti-Christian bigot by journalist Ezra Levant. He wrote an article condemning Nenshi after members of the church trespassed in city hall to Christmas carol and were escorted out in 2012. The church accused Nenshi of anti-Christian-Judeo discrimination. Nenshi partook in the lighting the fifth light of the menorah ceremony in 2011 as the Calgarian Jewish community celebrated the 23rd Menorah lighting ceremony. Other groups are free to celebrate at City Hall and other venues on city property provided they apply for permission such as agreeing not to celebrate during business hours. To address the challenges of evolving into metropolises Nenshi and former Edmonton mayor Stephen Mandel negotiated a memorandum of understanding with the Alberta government. This motion will enable both mayors to work with the provincial government to draft city charters, effectively articulating the powers and responsibilities the municipalities have to deal with unique issues of development such as taxation. Nenshi and Mandel wanted to seek the approval for the new city council's approval after the elections of the 2013 before proceeding to resume discussions. However these motions were initially opposed by tax watchdog groups. They warn that such legislatures may grant municipal governments the ability to levy additional taxes. On October 7, 2014, Alberta Premier Jim Prentice, Nenshi, and Iveson signed a framework agreement enabling the provincial and municipal governments of Edmonton and Calgary to formalize the charter by the Spring of 2016. According to the agreement although the municipalities won't be granted authority to levy new taxes; they will have the authority to create unique solutions that addresses the problems of their respective municipalities. 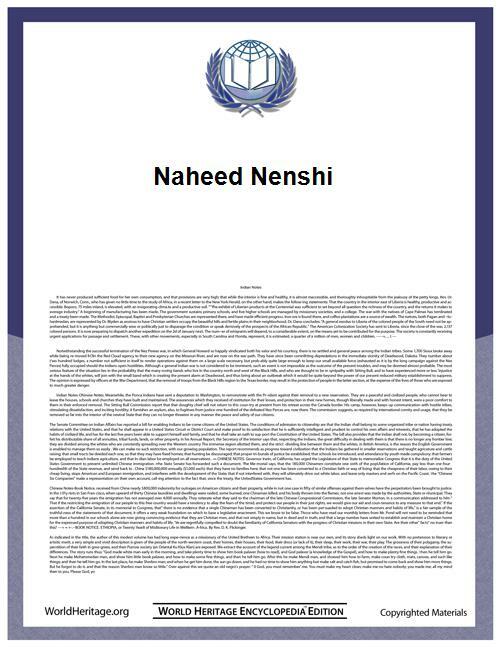 ^ a b c d "Naheed Nenshi". Calgary Herald. Retrieved October 19, 2010. 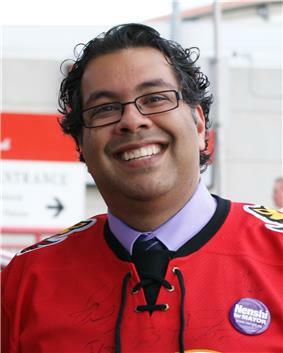 ^ "Naheed Nenshi re-elected as Calgary mayor". ^ a b Graveland, Bill (October 19, 2010). "Calgary's new mayor shreds city's stereotypes". Toronto Star. Retrieved October 19, 2010. ^ "Nenshi to give up 10% of salary". CBC News. January 23, 2012. Retrieved May 11, 2014. ^ "Gilmore and Nenshi named young global leaders". The Globe and Mail. March 11, 2011. Retrieved December 21, 2013. ^ "retrieved Oct.1, 2013". Cip-icu.ca. 2010-08-18. Retrieved 2014-05-12. ^ Ramsay, Melissa (November 21, 2013). "Calgary mayor named one of Canada's most important people". Global News Calgary. Retrieved November 21, 2013. ^ a b c Zhao, Jeremy (October 18, 2010). "All Eyes on Nenshi". Calgarypolitics.com. Archived from the original on June 19, 2013. Retrieved December 21, 2013. ^ "A. Rajabali, The Ismaili,4 May 2011, retrieved Oct 2, 2013". Theismaili.org. Retrieved 2014-05-12. ^ "Huffington Post Alberta.September 13, 2013,'Naheed Nenshi Calls Ezra Levant 'Creepily And Weirdly Obsessed'Paragraph 2". Huffingtonpost.ca. 2013-09-13. Retrieved 2014-05-12. ^ Gee, Marcus (February 5, 2011). "Naheed Nenshi's challenge: Making Calgary a livable city". The and Mail. Retrieved September 19, 2014. ^ Naheed, Nenshi (2002). "Building Up.Making Canada's cities magnets for talent and engines of development". Canada25. Retrieved December 21, 2013. ^ Andre, Todd (September 27, 2012). "CivicCamp Engages Calgarians to Create a More Liveable City". Avenuecalgary.com. Retrieved May 12, 2014. ^ a b "Calgary mayor-elect downplays egghead image". Canadian Broadcasting Corporation. October 19, 2010. Retrieved May 11, 2014. ^ "Eight challengers take aim at Calgary Mayor Naheed Nenshi". Calgary Sun. September 24, 2013. Retrieved May 11, 2014. ^ "Purple Revolution". Purple Revolution. Retrieved April 17, 2013. ^ a b Jinnah, Naila and Nikhat Ahmed (October 18, 2010). largest-city-in-Canada "Ismaili Muslim elected mayor of the third-largest city in Canada". TheIsmaili.org. Retrieved October 19, 2010. ^ a b c Cryderman, Kelly (October 23, 2010). "How Nenshi won the race". Calgary Herald. Retrieved May 11, 2014. ^ Braid, Don (September 26, 2010). "Nenshi capitalizing on social-media buzz". Calgary Herald. Retrieved May 11, 2014. ^ "Calgary election squabble over policing costs". Canadian Broadcasting Corporation. September 24, 2010. Retrieved May 11, 2014. ^ Markusoff, Jason (October 13, 2010). "Dead heat in race for mayor". Calgary Herald. Retrieved May 11, 2014. ^ "Election results". City of Calgary. October 19, 2010. Retrieved October 19, 2010. ^ a b Windgrove, Josh (October 19, 2010). "Calgary’s Naheed Nenshi becomes Canada’s first Muslim mayor". The Globe and Mail (Toronto). Retrieved May 11, 2014. ^ Kaufmann, Bill (October 19, 2010). "Nenshi win makes ripples around the world". ^ Koentges, Chris. "Politics in Full Sentences: The Story of Naheed Nenshi’s Purple Army". Retrieved 24 June 2013. ^ "Campaign signs and headquarters vandalized". CTV News (Calgary). September 13, 2010. Retrieved May 11, 2014. ^ "Nenshi uses fundraiser to warn supporters of "proxy" campaign against him in ward contests". Calgary Herald. April 4, 2013. Retrieved May 11, 2014. ^ "Nenshi donor list shows he has a lot of friends". CBC News. September 25, 2013. Retrieved October 15, 2013. ^ "Nenshi's campaign donors include developers, billionaires". CBC News. September 25, 2013. Retrieved October 15, 2013. ^ "'"Naheed Nenshi promises to tackle 'sprawl subsidy. CBC News. October 5, 2013. Retrieved October 21, 2013. ^ "Naheed Nenshi surprised by Manning Foundation findings". CBC News. October 9, 2013. Retrieved October 21, 2013. ^ Seskus, Tony (July 4, 2010). "Forest Lawn may get its due, 100 years late". Calgary Herald. Retrieved October 15, 2013. ^ Markusoff, Jason (October 11, 2013). "Nenshi’s promised Forest Lawn makeover: As "exciting new" as it was several years ago". Calgary Herald. Retrieved October 15, 2013. ^ Thompson, Suzy (December 15, 2011). "East Calgary's future". FFWD fast forward weekly. Retrieved May 11, 2014. ^ a b "Keystone opponents 'foolish,' says Calgary mayor". CBC News. January 28, 2013. Retrieved January 19, 2014. ^ Fletcher, Robson (January 13, 2014). "Neil Young entitled to his opinion but not a white hat, says Calgary Mayor Naheed Nenshi". Metro (Calgary). Retrieved May 11, 2014. ^ Sterritt, Angela (January 10, 2014). "Neil Young set to kick off Honour the Treaties tour". CBC News. Retrieved January 16, 2014. ^ Markusoff, Jason (January 16, 2014). "City hall needs more diversity at the top, says mayor". Calgary Herald. Retrieved January 19, 2014. ^ Walsh, Christopher (October 6, 2013). "Naheed Nenshi accusations "chill" Calgary election – Lord". Calgary Beacon. Retrieved May 11, 2014. ^ Franklin, Michael (January 15, 2014). "Mayor Naheed Nenshi files Statement of Defence". CTV News (Calgary). Retrieved January 19, 2014. ^ a b Elliot, Tamara; Vaessen, Doug (April 22, 2013). "EXCLUSIVE: Video obtained by Global News reveals Calgary developer’s plan to control city council". Global News. Retrieved January 19, 2014. ^ "Home builders' group looks to end rift with Calgary mayor". CBC News. February 25, 2013. Retrieved May 11, 2014. ^ a b Markusoff, Jason (January 10, 2014). "Nenshi cuts ties with industry groups". Calgary Herald. Retrieved May 11, 2014. ^ "Gays, tattooed people, minorities don't 'fit in' in suburbs: developers". CBC News. December 5, 2013. Retrieved May 11, 2014. ^ "Cal Wenzel Calgary Election Video: Naheed Nenshi Wants Investigation". Huffingtonpost.ca. Retrieved 2014-05-12. ^ a b "Naheed Nenshi, Colley-Urquhart attack Manning Centre - Beacon News : Beacon News". Beaconnews.ca. 2013-04-26. Retrieved 2014-05-12. ^ Geddes, Lisa (2013-04-24). "Demand builds for investigation into developer campaign contributions - Calgary". Globalnews.ca. Retrieved 2014-05-12. ^ a b Klingbeil, Annalise (November 15, 2013). "Home builder files $6M defamation suit against Nenshi". Calgary Herald. Retrieved November 15, 2013. ^ Martin, Kevin (November 15, 2013). "Homebuilder Cal Wenzel files lawsuit defamation against Mayor Naheed Nenshi". Calgary Sun. Retrieved May 11, 2014. ^ a b "Naheed Nenshi to be sued by home builder over 'Godfather' comments". CBC News. November 15, 2013. Retrieved November 15, 2013. ^ "Preston Manning breaks silence on home builders video". CBC News. May 31, 2013. Retrieved October 16, 2013. ^ Ferguson, Eva (October 8, 2013). "Higher property taxes for new suburbs urged think-tank". Calgary Herald. Archived from the original on October 9, 2013. Retrieved October 17, 2013. ^ a b Markusoff, Jason (June 17, 2013). "Time could not be reached for comment: Tsuu T’ina chief on ring road". Calgary Herald. Retrieved October 26, 2013. ^ Komarnicki, Jamie (October 29, 2011). "'"Chief says ring road 'on the back burner. Calgary Herald. Retrieved October 27, 2013. ^ "Calgary, Tsuu T'ina negotiate casino expansion utilities". CBC News. September 19, 2013. Retrieved May 11, 2014. ^ "Rob Ford vs. Naheed Nenshi: Understanding Toronto’s jealousy | canada.com". O.canada.com. 2013-05-29. Retrieved 2014-05-12. ^ "Rob Ford: ‘Intoxicated’ Toronto mayor asked to leave military ball". The Star (Toronto). March 26, 2013. Retrieved May 11, 2014. ^ "Toronto Mayor Rob Ford's office aides help run his football teams". The Globe and Mail (Toronto). September 12, 2012. ^ "Rob Ford: Sarah Thomson wants apology after accusing Toronto mayor of inappropriate touch". The Star. March 8, 2013. Retrieved May 11, 2014. ^ "Massive police raid launched in Toronto". The Star. June 13, 2013. Retrieved May 11, 2014. ^ "Rob Ford accepts Grey Cup bet from Calgary Mayor Nenshi". CBC News. November 19, 2012. Retrieved May 11, 2014. ^ "Naheed Nenshi ready to take on Rob Ford in fitness fight". CBC News. January 11, 2012. Retrieved May 11, 2014. ^ "Airport tunnel now belongs to Calgary Airport Authority". ^ Fletcher, Robson (February 10, 2013). "Calgary’s King Edward School on the cusp of becoming ‘arts incubator’". Metro. Calgary. Retrieved April 17, 2013. ^ Gee, Marcus (August 23, 2012). "Naheed Nenshi's challenge: Making Calgary a livable city". ^ "New central library plan approved by council". ^ "National Music Centre breaks ground in Calgary". Canada Newswire. February 22, 2013. Retrieved April 17, 2013. ^ "The City of Calgary - Community Investment Fund". Calgary.ca. Retrieved 2014-05-12. ^ "Calgary project looks to SPUR revitalization in Kingsland". CBC News. January 19, 2013. Retrieved May 11, 2014. ^ "Calgary removing fluoride from water supply". ^ "FFWD - Calgary News & Views - News - Mayorâ€™s key campaign plank may fail". Ffwdweekly.com. 2011-03-03. Retrieved 2014-05-12. ^ Fletcher, Robson (September 16, 2013). "Calgary council tees up secondary-suite fee reduction for next council". Metro (Calgary). Retrieved May 11, 2014. ^ a b "City approves 338-stall automatic parking garage". CBC News. September 10, 2013. Retrieved May 11, 2014. ^ "Parkade proposed to fund heritage restoration". CBC News. August 19, 2010. Retrieved May 11, 2014. ^ Markusoff, Jason (December 2, 2013). Peak toilet' problem puts brakes on northwest development"'". Calgary Herald. Retrieved May 11, 2014. ^ "Travelling Light Sculpture: Calgary Public Art Piece Panned By Nenshi, Calgarians". Huffingtonpost.ca. Retrieved 2014-05-12. ^ Gerson, Jen (October 9, 2013). "Calgary mayor hates ‘awful’ new public art installation — a large blue circle that cost the city $471,000". National Post. Retrieved October 17, 2013. ^ Landry, Frank (September 8, 2010). "Alberta defends environmental record to US Legislators". Calgary Herald. Retrieved October 20, 2013. ^ Cosh, Colby (October 4, 2010). "James Cameron in Alberta's Oil sands". Maclean's. Retrieved October 20, 2013. ^ Cyderman, Kelly (February 22, 2009). "Alberta gets fresh black eye with tar sands coverage". Oilsandstruth.org. Retrieved October 20, 2013. ^ D'Aliesio, Renata (July 9, 2008). "Alberta pumps $4B into eco-plan". Calgary Herald. Retrieved October 20, 2013. ^ Sylvester, Krista (December 21, 2009). "Calgary mayor back from climate summit with city award". Metro News Calgary. Retrieved October 20, 2013. ^ Harvey, Linda 'Water and Energy conservation: city of Calgary" ,Environment Canada, July 2009 http://www.ec.gc.ca/p2/default.asp?lang=En&n=E6117DC3-1 retrieved October 20, 2013. ^ "Embattled Enmax CEO quits". CBC News. January 21, 2011. Retrieved October 9, 2013. ^ Cummer, Dean (December 6, 2010). "Enmax CEO makes Biggest Screw-up list". Financial Post. Retrieved May 12, 2014. ^ Cuthbertson, Richard (January 25, 2011). "'"Nenshi takes aim at Enmax's 'culture of entitlement. Calgary Herald. Retrieved May 12, 2014. ^ "Calgary mayor hopefuls slam Enmax CEO's pay". CBC News. October 12, 2010. Retrieved October 9, 2013. ^ Markusoff, Jason (May 21, 2011). "'"Nenshi takes aim at Enmax's 'culture of entitlement. Calgary Herald. Retrieved May 12, 2014. ^ Markusoff, Jason (March 2, 2012). "Enmax announces new CEO". Calgary Herald. Retrieved May 12, 2014. ^ "Shepard power plant breaks ground". CBC News. October 4, 2011. Retrieved October 8, 2013. ^ Spruit, Kristen (September 23, 2013). "Noise in southeast Rocky View due to construction". Rocky View Weekly. Retrieved May 12, 2014. ^ Howell, Trevor (December 6, 2013). "Proposed dance facility in Beltline gets $5.5-million funding pledge from city". Calgary Herald. Retrieved May 12, 2014. ^ "Rocky road to ring road may be near end". Calgary.ctvnews.ca. 2013-09-19. Retrieved 2014-05-12. ^ "Calgary's 30-year transit plan to cost $13 BILLION". ^ Kaufmann, Bill (2013-08-30). "retrieved 13 2013". Calgarysun.com. Retrieved 2014-05-12. ^ Kaufmann, Bill (2013-09-11). "Calgary Transit unveils new C-Train cars | Calgary | News". Calgary Sun. Retrieved 2014-05-12. ^ Bray, Daorcey Le (2011-04-01). "Mayor Nenshi | The City of Calgary - Bye-Bye $3 Park-and-Ride!". Blog.calgarymayor.ca. Retrieved 2014-05-12. ^ "Transit parking fee cancellation no joke, says city | Calgary | News | Calgary S". Calgarysun.com. Retrieved 2014-05-12. ^ Zickefoose, Sherri (March 5, 2013). "Council OK’s $30,000 for next stage of railway yard noise study". Calgary Herald. Retrieved April 17, 2013. ^ "Nenshi, Canadian Pacific square off over derailment". The Globe and Mail (Toronto). June 28, 2013. ^ "Canadian Press.Sept 13, 2013,'Nenshi wants answers from Canadian Pacific about derailment', Retrieved October 6, 2013". .macleans.ca. 2013-09-12. Retrieved 2014-05-12. ^ "Transforming Government". City of Calgary. 2013. Retrieved April 17, 2013. ^ "Calgary red tape cutting program reports over $1 million in savings - Calgary Beacon : Calgary Beacon". Beaconnews.ca. 2013-03-13. Retrieved 2014-05-12. ^ "retrieved Oct 1, 2013". Theismaili.org. Retrieved 2014-05-12. ^ Nenshi, Naheed (September 6, 2012). "Nenshi: Let’s improve Calgary in big and small ways". ^ Markusoff, Jason (2013-05-15). "New strategy aims to halve poverty by 2023". Calgaryherald.com. Retrieved 2014-05-12. ^ "Airdrie teen inspires council on anti-bullying bylaw". CBC News. June 17, 2013. Retrieved May 11, 2014. ^ Austin M. Davis Published on September 23, 2013. "A second chance to take on bullying - Local - The Moose Jaw Times Herald". Mjtimes.sk.ca. Retrieved 2014-05-12. ^ "retrieved September 2013". Calgary.ctvnews.ca. 2013-07-30. Retrieved 2014-05-12. ^ Moharib, Nadia (2013-07-25). "Calgary clinches enviable spot on crime rate list of Canadian cities | Calgary |". Calgarysun.com. Retrieved 2014-05-12. ^ Kevin Drum. "America's Real Criminal Element: Lead". Mother Jones. Retrieved 2014-05-12. ^ "Yes, lead poisoning could really be a cause of violent crime | George Monbiot | Comment is free". The Guardian. 2014-04-07. Retrieved 2014-05-12. ^ "Sharp drop in robberies helps drive down Calgary’s overall crime rate". .canada.com. 2013-07-25. Retrieved 2014-05-12. ^ "retrieved September 20, 2013". Calgary.ctvnews.ca. 2013-09-19. Retrieved 2014-05-12. ^ Cody Stuart (2013-02-28). "Calgary Capital Conservation Grants – Community Development – CREBnow". Crebnow.com. Retrieved 2014-05-12. ^ "retrieved September 8, 2013" (PDF). Retrieved 2014-05-12. ^ "Calgary food trucks here to stay". CBC News. September 6, 2013. Retrieved May 11, 2014. ^ Gandia, Renato (May 12, 2011). "Nenshi leads China trade mission". ^ "Retrieved September 20, 2013". .canada.com. 2013-05-21. Retrieved 2014-05-12. ^ Thomas, Myke. "Retrieved September 20, 2013". Calgarysun.com. Retrieved 2014-05-12. ^ "Pay attention to your own budget, Mayor Nenshi - Appeared in the Calgary Herald". Fraser Institute. Retrieved 2014-05-12. ^ a b "Calgary Mayor Naheed Nenshi: Canada's crumbling cities and roads must be fixed". The Globe and Mail (Toronto). March 21, 2013. ^ "FFWD - Calgary News & Views - News - Skipping along the mayorâ€™s long road". Ffwdweekly.com. 2010-08-19. Retrieved 2014-05-12. ^ "City projects at mercy of outside funds, Mayor Nenshi says". .canada.com. Retrieved 2014-05-12. ^ "City charters delayed for Calgary and Edmonton". .canada.com. Retrieved 2014-05-12. ^ "Premier Alison Redford, one year after the election". CBC News. April 23, 2013. Retrieved May 11, 2014. ^ a b "Cuts coming back to bite Redford". The Globe and Mail (Toronto). March 7, 2013. ^ Zickefosse, Sherri (April 10, 2012). "Calgary business tax to merge". ^ "Calgary mayor, aldermen publicly debate how to spend $52M". CBC News. May 28, 2013. Retrieved May 11, 2014. ^ "Council votes to put $52M tax surplus toward flood relief". CBC News. July 29, 2013. Retrieved May 11, 2014. ^ "Nenshi proclaims Trans Day of Visibility". ^ "Alison Redford Named Calgary Gay Pride Parade Grand Marshal". Huffingtonpost.ca. 2013-08-30. Retrieved 2014-05-12. ^ "Nenshi to Quebeckers: Come to Calgary, we don't care how you worship". The Globe and Mail (Toronto). September 2, 2013. ^ Clark, Jessica (March 2, 2012). "Calgary’s hope as cultural centre rests on revamping cowboy image". Calgary Journal. Retrieved April 17, 2013. ^ Lawrence, Jo Ann (March 28, 2012). "100 day kick off to the 100th Calgary Stampede at Olympic Plaza". Calgary Beacon. Retrieved April 17, 2013. ^ "The City of Calgary". Calgary.ca. Retrieved 2014-05-12. ^ Calgary mayor Nenshi makes good on Grey Cup bets. CBC News, November 29, 2012. ^ "Calgary 2012". Calgary 2012. 2013. Retrieved April 17, 2013. ^ Markusoff, Jason (January 22, 2013). "Nenshi’s invite to World Economic Forum is a rare honour". ^ "retrieved September 26, 2013". Freenewspos.com. Retrieved 2014-05-12. ^ Turner, Katie (2013-06-28). "Mayor Nenshi urges Calgarians to take care of mental health | Metro". Metronews.ca. Retrieved 2014-05-12. ^ "Alberta floods: Keeping up with Calgary Mayor Nenshi". CBC News. June 25, 2013. Retrieved May 11, 2014. ^ Dean Bennett (2013-06-28). "retrieved Sept 13, 2013". Theglobeandmail.com. Retrieved 2014-05-12. ^ "retrieved, 13,2013". Calgary.ctvnews.ca. 2013-06-24. Retrieved 2014-05-12. ^ Dean Bennett (2013-06-28). "retrieved Sept 13,2013". Theglobeandmail.com. Retrieved 2014-05-12. ^ "Mayor Naheed Nenshi has Superman status in Calgary | National Post". News.nationalpost.com. 2013-06-28. Retrieved 2014-05-12. ^ "Naheed Nenshi Reads Rona Altrows's Book About The Alberta Flood". Huffingtonpost.ca. 2013-07-25. Retrieved 2014-05-12. ^ "Nenshi names official to oversee Calgary flood recovery". CBC News. July 8, 2013. Retrieved May 11, 2014. ^ Ramsay, Melissa (2013-08-27). "UPDATE: City unveils flood mitigation panel, as flood costs balloon - Calgary". Globalnews.ca. Retrieved 2014-05-12. ^ Jenna Mcmurray. "Sun News : Calgarians to get special award from GG". Sunnewsnetwork.ca. Retrieved 2014-05-12. ^ Franklin, Micheal. 'City of Calgary to close Midfield Mobile Home Park'.CTV Calgary, May 27, 2014. http://calgary.ctvnews.ca/city-of-calgary-to-close-midfield-mobile-home-park-1.1840292 retrieved November 11, 2014. ^ "All means all | Columnists | Opinion". Toronto Sun. Retrieved 2014-05-12. ^ "Sun columnist's anti-Muslim trash talking has no place in Canada : Calgary Beacon". Beaconnews.ca. 2012-01-06. Retrieved 2014-05-12. ^ "M.Toneguzzi Calgary Herald,December 17, 2011, retrieved Oct 2 2013". .canada.com. Retrieved 2014-05-12. ^ "Alberta government partners with Calgary and Edmonton to develop big city charter". Alberta Government. June 18, 2012. Retrieved April 17, 2013.